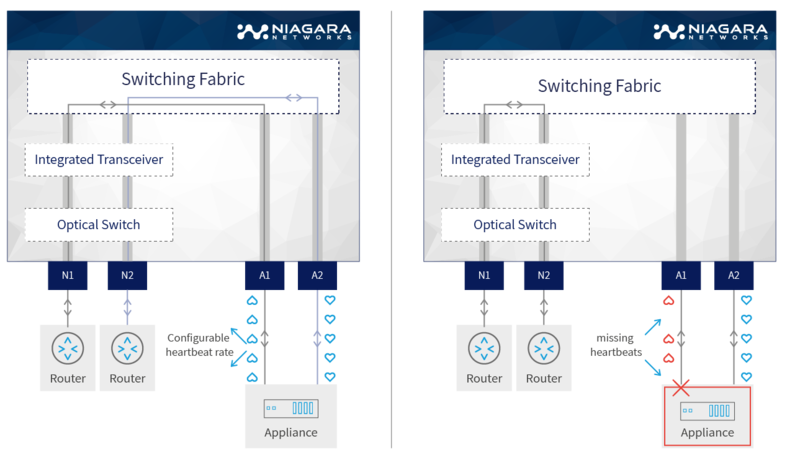 Niagara Networks provides all the building blocks for an advanced Visibility Adaptation Layer at all data rates up to 100Gb, including taps, bypass elements, packet brokers and a unified management layer. Thanks to its integrated in-house capabilities and tailor-made development cycle, Niagara Networks are agile in responding to market trends and in meeting the customized needs of service providers, enterprise, data centers, and government agencies. Niagara Networks provides high performance network visibility solutions to allow seamless administration of security solutions, performance management and network monitoring. Niagara Networks products provide advantages in terms of network operation expenses, downtime, and total cost of ownership. Niagara Networks are industry leaders in the network visibility market with technology and products that have been perfected over the last 20 years. 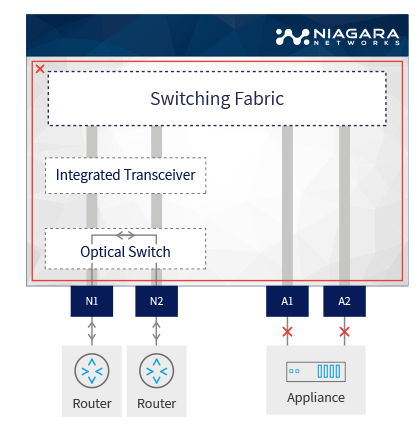 Niagara is proud to have developed the first multi-segment 100G bypass switch and external bypass switch, and have recently expanded with 1GE, 10GE and 100GE network visibility products and solutions, while offering the highest port density systems. Niagara Networks partners with world wide technology leaders to provide high performance network visibility and security. Our partners include companies that are technology alliances and companies who take part in distributing Niagara's solutions. What is a Network Bypass Switch? 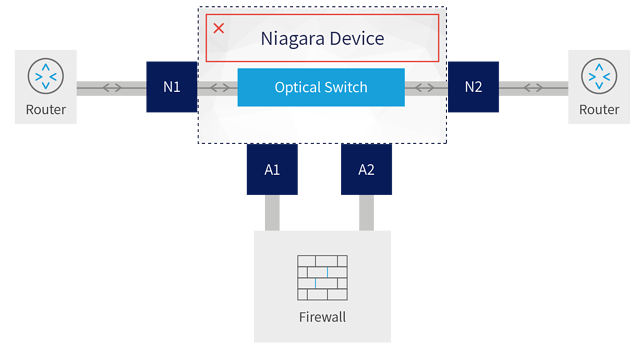 A Network Bypass Switch is a hardware device, which ensures failover or fail-safe capabilities for an inline networking device or a network security tool (such as a firewall or an intrusion detection and prevention system). If the network appliance fails or needs to be taken off-line for whatever reason, its traffic is automatically rerouted, ensuring uninterrupted traffic flow on the network. Sometimes also referred to as a bypass tap, the network bypass switch, is a special type of active tap. It is used to connect a network segment at a specific network access point (AP) where there is an active, inline device (such as a security tool that is there for inspection and monitoring purposes). Functionally, it can reroute traffic automatically by monitoring the tool’s health or can manually be made to redirect traffic (such as when disconnecting the monitoring tool for maintenance or other motives). Since the inline network devices are essential to the overall functioning of the enterprise network – any issue with them can critically effect network performance. Each network device that is placed inline is a potential single point of failure in the computer network. If the device should experience even the shortest period of system hang-up or failure (that takes time for a reboot or any kind of troubleshooting), then traffic flow will be discontinued. Even for maintenance or replacement purposes, disconnecting the device will interrupt normal traffic flow at that point. Any dropped data packet is a potential cause of error or inaccuracy in the processes and applications that depend on receiving those data packets. Thus, the network bypass switch – that can circumvent any and all interruptions at that critical AP or network link – is an essential element of the network infrastructure. The network bypass switch eliminates this point of failure by redirecting the network data traffic to bypass around the network device at that point, whenever that device is incapable of processing or passing the traffic. In case the bypass switch itself is somehow compromised, it contains a relay switch that is designed to close and go to 'bypass mode' and allow the traffic to seamlessly flow through its cable to maintain an uninterrupted and open link with the rest of the network. This is especially important with regards to security devices that need to continuously defend the network against malevolent attacks and security breaches. 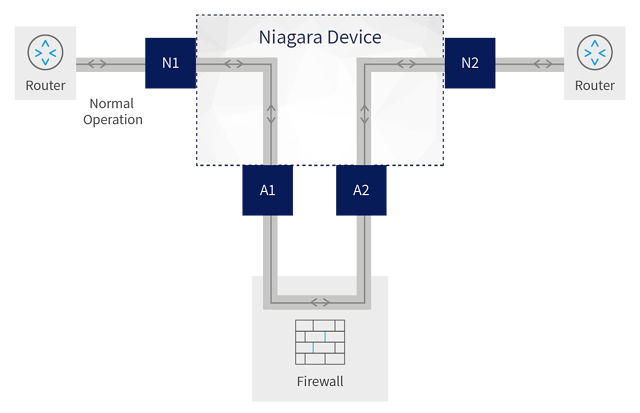 The BypassP² product line encompasses all of Niagara’s Bypass Switches. Our signature BypassP² offers double-protection bypass technology. A failsafe optical/copper relay on network ports, and user-configurable heartbeat-generated packets on appliance ports. 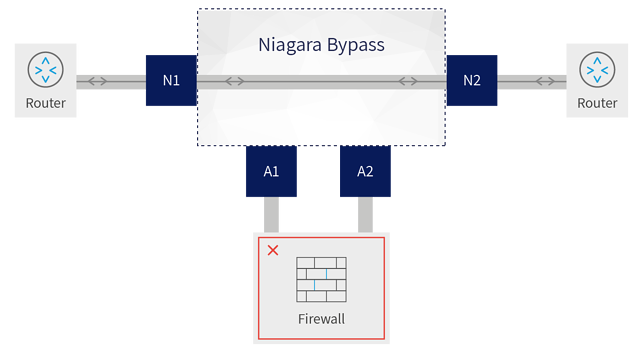 BypassP² is available in multiple bypass segment options, supporting a range of network interfaces up to 100Gb. Each BypassP² segment comprises two network ports and two appliance ports. All products based on BypassP² can be user-configured as active taps as well. The traffic between 2 network elements N1 and N2 go through an inline network security tool. the bypass makes sure the traffic between N1 and N2 remains up and running. Protecting network traffic flow in case of BypassP² failure. When power fails, the optical-relays in the bypass switch ensure that the network flow continues uninterrupted. The optical relays can be configured fail open or fail close to meet specific deployment needs. This ensures uninterrupted network services under all conditions. Protecting network traffic flow in case of appliance failures. The BypassP² transmits a user-configurable heartbeat on the appliance ports. In the event of an appliance malfunction (such as a software crash, system failure or loss of power), the failure is detected, and the BypassP² redirects the traffic intended for the inline appliance to the network ports, allowing it to continue to flow through the network link. This feature also enables the network appliances or network security tools to be removed and replaced without network downtime. Once the system is backed up, or the power is restored to the appliance, it is detected by the BypassP² heartbeat mechanism, and network traffic is seamlessly diverted back to the inline device, allowing it to resume its critical functions. Wide selection of segment modules.